Keppel Corp and SPH are considering a potential transaction involving their respective 19.3% and 13.5% stakes in M1. A general offer for M1 shares would be triggered if both Keppel T&T and SPH divest of their M1 shares. The potential investor could be attracted by the possible consolidation of the mobile industry from four to three players over the longer term. Upgrade M1 to BUY (Target Price: S$1.88). BUY StarHub as the stock would play catch-up (Target Price: S$1.92). Keppel and SPH exploring divestment of stakes in M1. Keppel Corporation (Keppel) announced that it is considering a transaction involving its indirect interest in M1. Concurrently, Singapore Press Holdings (SPH) has also announced that it has been approached by Keppel Corporation to participate in a possible transaction involving its interest in M1. Both Keppel Corporation and SPH cautioned that there is no certainty or assurance that any transaction would occur. Potential GO if both KPTT and SPH divest M1. Keppel Telecommunications & Transportation (KPTT) owns 19.3% of M1 while SPH owns 13.5% of M1. A general offer for M1 would be triggered should both KPTT and SPH divest their respective stakes in M1. There was no announcement from Axiata Group, which owns 28.7% of M1. M1 has requested for trading halt pending release of announcement. We expect announcement of the deal within this week. A play on potential industry consolidation. potential acquirer benefits from price stability after the industry consolidation. Spin-off of TPG Singapore before TPG VHA merger. TPG Telecom intends to undertake a separation of its Singapore mobile business to its existing shareholders through an in-specie distribution before the implementation of merger between TPG and Vodafone Hutchison Australia (VHA). TPG Singapore would become a separate standalone company, presumably listed on ASX. The separation is subject to approval from the Infocomm Media Development Authority (IMDA) in Singapore. Three possible scenarios for M&A. M&A between StarHub and M1. The merger of StarHub and M1 would create a strong number two with combined market share of more than 40% in mobile services. However, it would be expensive for StarHub to mount a takeover offer for M1 given that M1 trades at a premium valuation compared with StarHub. M&A between StarHub and TPG Singapore. TPG Singapore is smaller and more digestible. Acquiring TPG Singapore should present a lower price tag for StarHub to achieve the goal of consolidating the mobile industry and restoring price stability. M&A between M1 and TPG Singapore. The merger of M1 and TPG Singapore could be achieved via a share swap. However, foreign investors, including Malaysian and Australian shareholders, could garner more voting rights compared with local shareholders, which could be unwelcomed by the authorities. 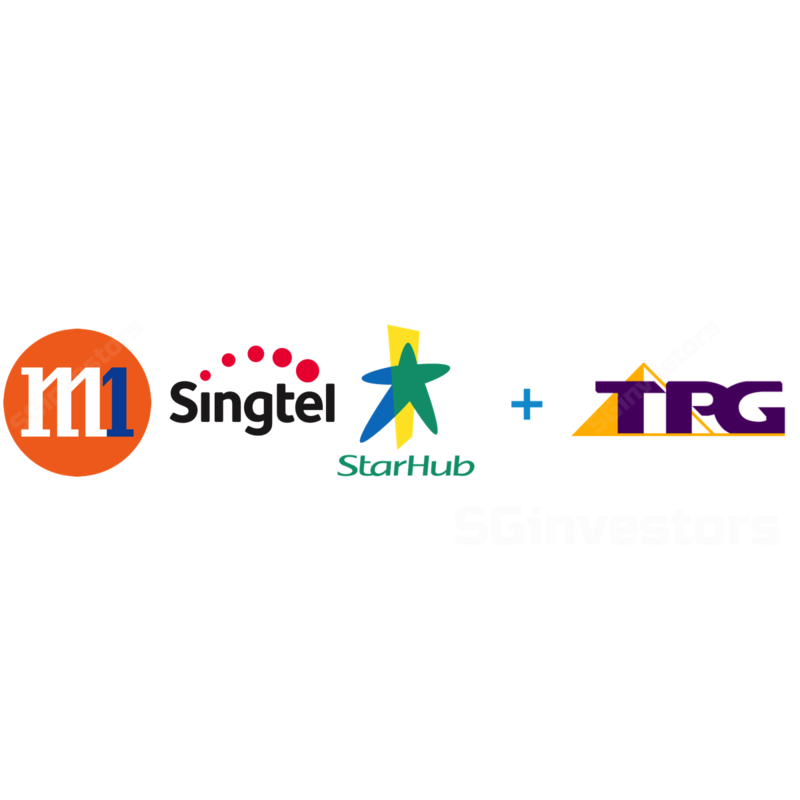 The separation of TPG Singapore affords StarHub the flexibility of acquiring either M1 or TPG Singapore. We upgraded the Singapore telecommunications sector from MARKET WEIGHT to OVERWEIGHT on 7 Sep 18: See report: Singapore Telecommunications - Delay brings reprieve. Our channel checks suggest that TPG would launch trial for its 4G mobile network by 4Q18. We expect mobile services on a commercial basis to commence in 2Q19. This represents a delay of 4-6 months compared with our original expectations. The delay encountered by TPG Singapore affords incumbents more time to further saturate the market. To recap, TPG secured 20MHz of 900MHz spectrum and 40MHz of 2300MHz spectrum for provision of 4G services at S$105m. The spectrum rights commenced on 1 Apr 17 and last for 16 years. Telcos recorded positive net additions and post-paid mobile subscribers increased on a y-o-y basis during the Global Financial Crisis. Our previous study on share price performance indicates that telcos in Singapore have a 73% chance of outperforming the MSCI Singapore Index during recessions. Telcos provide a shelter against the risk of contagion spreading across emerging markets. Singtel provides a defensive shelter due to its geographical diversification. Mobile business in Singapore accounts for only 7% of group revenue if we include its proportionate share of its associates’ revenue. We have lowered our target price to S$3.94 (COE: 6.25% and terminal growth: 1.5%) after factoring in recent depreciation of the Indonesian rupiah (3Q18: -3.7%) and Indian rupee (3Q18: -6.1%) against the Singapore dollar. Execution has improved since Peter Kaliaropoulos took over as CEO on 9 Jul 18. Within two months of his appointment, StarHub has scaled up in cyber security with the merger of Accel Systems & Technologies with Temasek’s Quann World to form Ensign InfoSecurity. Our target price of S$1.92 is based on DCF (COE: 9.0% and terminal growth: 1.0%). Interest from potential acquirer would inject upward momentum for the stock. We have lowered beta from previous 1.1x to a more normalised 0.95x. Our target price of S$1.88 is based on DCF (COE: 7.5% (previous: 8.25%), terminal growth: 1.0%). Maintain BUY. Our target price of S$0.95 is based on DCF methodology (cost of equity: 7.0%, terminal growth: 2.0%). Impending entry of TPG Telecom as the 4th mobile operator in 4Q18. Competition and pricing erosion worsen more than anticipated post entry of TPG. M1 and StarHub not closing the deal or achieving the desired cost savings from network ring.